I have always been an advocate of keeping things simple. This is particularly true when it comes to self-defense. When presented with danger, fine motor skills will be diminshed. As humans, we are designed to do one task at a time. We do not multi-task, rather we switch task. In a self-defense situation, you must react to danger in a swift, simple and effective manner. The non-lethal self-defense products I most often recommend are pepper spray, flashlights and personal alarms. When conducting self-defense training I am often asked which item is the most important to carry. Few people will carry more than one device for personal protection. This is a difficult question to answer, as situations are dynamic and wide-ranging. Most often I will recommend pepper spray and a flashlight. Even if an individual carries multiple items for self-defense, the likelihood of being able to utilize multiple items at the same time is slim to none. Dispenses a powerful stream of the hottest available pepper spray. Sounds an ear piercing alarm to alert others and scare off an attacker. Activates 3 LED strobe lights that flash 19 times per second. Sends text messages to your emergency contacts with a Google map link providing directions to your location. Calls your emergency contacts, alerts them you are in trouble and notifies them to check their texts messages for your location. What makes the Plegium Smart Pepper Spray unique is that each of the functions it performs are best-in-class. Previous attempts by other manufacturers to produce self-defense devices that perform multiple functions resulted in compromise. Pepper spray is one of the best non-lethal options for self-defense. Pepper spray has a high success rate and works against those under the influence of drugs and alcohol, as well as animals. The effects of pepper spray wear off in approximately 30 minutes, making it safe and easy to use. 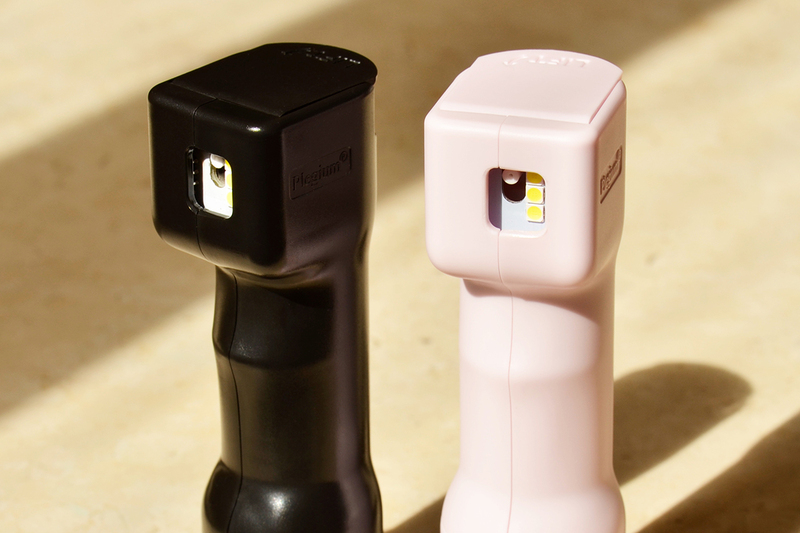 The pepper spray in the Smart Pepper Spray is one of the hottest available. It is tested to the maximum allowed 1.33% major capsaicinoids. Translation? The Plegium Smart Pepper Spray is extremely hot. The spray pattern is an optimized stream reaching out to 10 feet. Each unit has up to 10 shots of pepper spray. In my tests, the spray pattern is a perfect balance of coverage and a high output stream that will minimize blowback to the user. The activation button has a “sensory sight” on it. A distinct ridge on top of the trigger lets you feel the direction of the spray stream, helping you aim under reduced visibility. Alarms provide safety by one of two ways. First, they may alert others that you need help. Second, they may scare off the attacker. Attackers do not like to have attention drawn to them. The alarm on the Plegium Smart Pepper Spray is 130 dB. This is the loudest personal alarm available. Anything above 140 dB is considered not hearing safe. Again, although the Plegium Smart Pepper Spray does many things, all of what it does are best-in-class. One of the best ways to buy yourself some precious time to create an avenue of escape is to disorient an attacker. Temporarily blinding an assailant with light is an effective way to disorient and degrade reaction time. The Plegium Smart Pepper Spray contains 3 LED strobe lights that blink 19 times per second. This rapid blinking of light disrupts the images going from the eyes to the brain which causes confusion and disorientation. In addition to disorienting an attacker, the strobe illuminates the scene, helping you better aim when deploying the pepper spray. The strobe is powered by its own dedicated battery pack, which ensures maxim luminosity. Although the strobe isn’t as powerful as a dedicated flashlight, it is a good balance of size, battery life and effectiveness. The Plegium Smart Pepper Spray comes with a free smart phone app that works on both Apple and Android devices. Plegium claims a 1 minute setup. I can confirm that this is absolutely true. Simply download the app, tap the “Connect Device” button, enter the 4-digit code located on your Smart Pepper Spray and your Plegium Smart Pepper Spray will be wirelessly connected via Bluetooth to your smart phone. Add emergency contacts and your setup is complete. There are two things that set the Plegium smart phone app apart. First, it’s free! Most similar apps charge a monthly, recurring fee. Second, the app can be used with multiple devices. For example. let’s say you have three Smart Pepper Sprays; one in your car, one on your keyring and one in your nightstand. You can connect each of the Smart Pepper Sprays to the smart phone app. When you are in close proximity to each device with your cell phone, the app will automatically connect to the Smart Pepper Spray. One of the most important aspects of summoning help is communicating your exact location. Often times those that are in need of help do not know and are unable to communicate their location. When fired, the Plegium Smart Pepper Spray will communicate with the smart phone app. The app will retrieve the GPS coordinates of your location from your cell phone and text message a link to a Google map with your location to your emergency contacts. All of this happens atomically when the Smart Pepper Spray is fired to deploy pepper spray against an aggressor. It is important to remember that even in areas of poor receptions, often times text messages can be sent when cell phone voice calls cannot be made. When it comes to summoning help, redundancy is welcomed. In addition to text messaging emergency contacts with your location, phone calls are made alerting contacts that you are in trouble and to check text messages for location information. The Plegium Smart Pepper Spray has a 4-year battery life and requires no charging. The Bluetooth chip, the siren and the strobe LEDs are all powered by separate battery packs, ensuring maximum connection reliability, sound pressure and luminosity.